The 2017 GAMA Trade Show in Las Vegas, Nevada, a convention for board game industry folk, is officially over. As can be expected there have been a lot of exciting announcements and news from the convention. Here is a smattering of the news that caught my eye. Portal Games showcased their upcoming 4X card game called Alien Artifacts. They promise that 4X experience condensed into a quick card game. 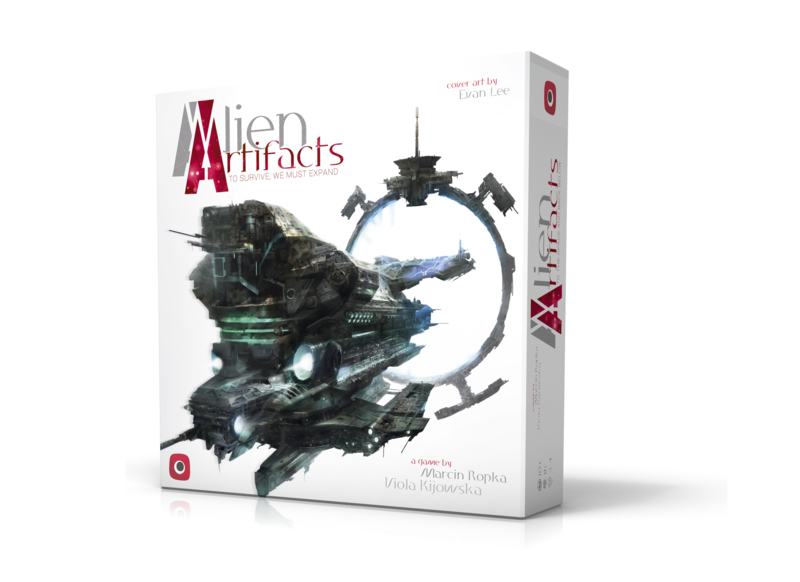 Alien Artifacts is about exploring planets, space combat and researching new technologies. There are four different tech paths, which quickly develop into different strategic play for the players. The way the game essentially works is that the cards that you draw will all have different resources along the four sides of the cards, for example those resources could be something like science or combat. 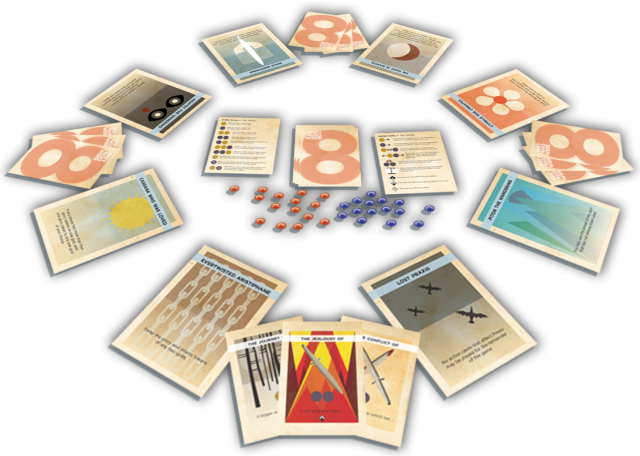 The players will then choose to use the card for one of those resources. The amount of cards you draw will depend on your production value. Currently the game has about 50 different planets to explore. When you discover a planet, you will make the choice to either exploit it for its resources or settle it for a bonus that you’ll get for the whole game. Alien Artifacts also has lots of different ships, all with their own unique abilities and ways to attack. There are also different factions that players are a part of, which again gives different skills to those players. The game should have a high replay-value and is billed as having very simple mechanics. They are currently working on a solo variant to make the game 1-4 players. They hope to release the game at Essen Spiel 2017. 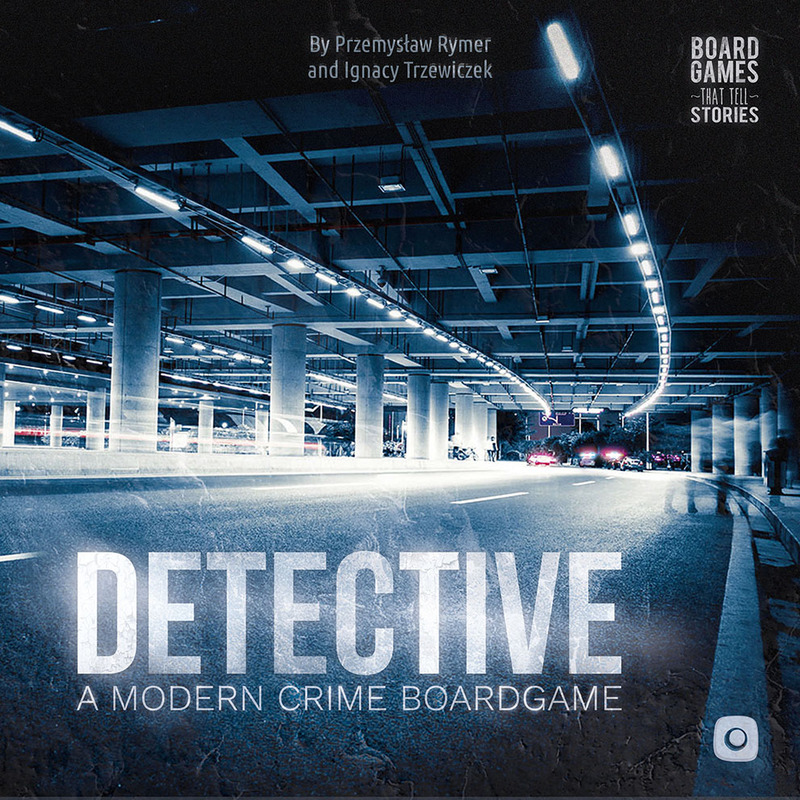 Detective: A Modern Crime Board Game in many ways is similar to Sherlock Holmes Consulting Detective, in as much as there are cases to solve with paragraphs to read that will give the players the clues they need to solve the case. But there’s a twist. Portal Games has added another layer to the game. They are developing a companion website that will go along with the game. The website is almost like a database where you can cross reference information. It is also where you will get test results from evidence that you are sending off to the lab. Another unique thing about this game is that players are encouraged to use outside sources to try to solve the case, like Google and Wikipedia. The game is supposed to cross the fourth wall, meaning the gamers are not just playing investigators, but are becoming the investigators in real life. The goal of the game is to totally immerse you in the case. The game will have 5 crimes, all of which are connected. The fifth case is a culmination of the previous cases. Each case takes about 3-4 hours to complete, and they hope to release the game sometime next year. Custom Heroes is a trick-taking ladder style game, where as you play you are actually changing the values of the cards by putting different sleeves on them. The deck of cards is dealt out to all of the players until the cards are all gone. The cards all have values ranging from 1-10. The first player will pick a set of cards to play into the center as the opening gambit. If they choose to play two threes the next player would need to improve on that value, meaning they could play something like two fours. The twist is that players will also have advancement card sleeves, which overlay the base cards and change the value of those cards. These advancement card sleeves stay on the card for the rest of the game, and there can be more than one sleeve played on a card. Another interesting part of Custom Heroes is that at the end of the round, all of the cards are taken back up, shuffled together, and then passed back out to everyone. So more than likely the card you upgraded will end up in someone else’s hand. More than that, the distribution and values of the cards will also be different, and will continue to change throughout the game. This will totally affect your strategy of play (if you can remember all the ways the cards have been changed). AEG says that Custom Heroes should be out in Quarter 3 of 2017. No word yet on how much the game will cost. 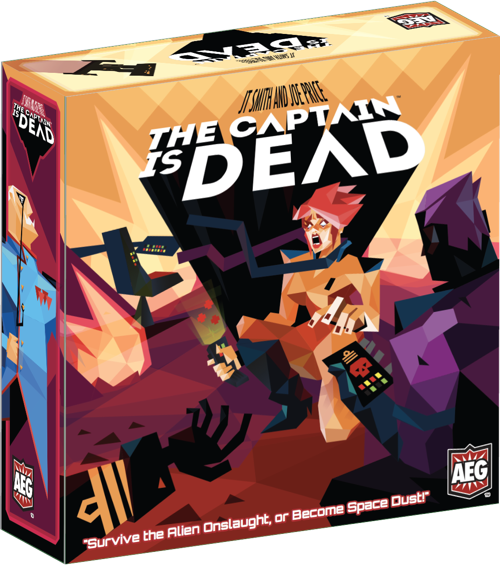 The Captain is Dead’s whole conceit is that you are a crew on a starship where, surprise, the captain has just died. This co-op game has the ultimate goal of attempting to fix the jump core. But as you play there will be tons of other emergencies that come up that you’ll have to deal with. For instance there will be enemy ships firing on you, other parts of the ship will break, etc. But every action you take to deal with those crises, the less actions you have to try to fix that jump core. Everyone loses if your shield track reaches zero and your ship is hit again. The Captain is Dead will have 17 unique crew roles to play with, which definitely gives it great replay value. The game is set to release in April or early May 2017. It is for up to 7 players and will cost $49.99. Like normal Codenames, Duet will have two teams trying to guess the codenames of their agents. But the twist is that the two sides are actually working together to find all the agents. Instead of the clue givers looking at the same grid, this time they are using opposite sides of the clue card, which are both different. They are each trying to give clues for nine agents, but three of those agent’s words are the same for each side. Another difference is that both sides have an assassin word. And if you guess too many innocent bystanders, everyone loses. They are hoping to release Duet at Gen Con 2017. The price will be the same as all of the other Codenames, $19.95. The nice thing about Duet is that they curating a new word list for the game, which you could combine with any of the other versions of the game. This basically makes it both an expansion and its own standalone game at the same time. Czech Games is partnering with USAopoloy to publish a Marvel-themed Codenames and a Disney-themed Codenames. USAopoly is handling the publishing, which Czech Games will be designing the games. They didn’t reveal much at GAMA, other than that there will be new concepts for those games, as well as the fact that the cards will have pictures on one side and words on the other. Okay, so this wasn’t so much of an announcement, as just showing off a game that was very recently released. I had never heard of this game, and it’s super interesting and unique. This semi-co-op game is all about these different gods who are trying to win enough glory to be remembered for the rest of time. The players are each serving two different gods, and attempting to win them glory. The gods will be dealt out to the right and left of every player. You want the combined glory of the gods between you and one of your neighbors to be more than the combined glory of the gods between any two other players. That makes you eligible to win the game. Once you qualify to win, you want to have the least amount of glory on your god versus the god of your partner. A bit of a mind bender, true, but it definitely sounds like a really unique and fun game. To make it a bit more mind-bendy, the game play itself is a bit interesting as well. Each round everyone draws up to three cards. When you play a card, you then pass one of your remaining cards to the person on your left. At the end of the round, everyone draws back up to three. These cards will let you put glory on other people’s gods, never your own gods. You’ll also be able to play infamy onto other gods, which is negative points. They Who Were 8 was just released, is for 2-4 players, and costs $25. It is definitely now on my to-play list! 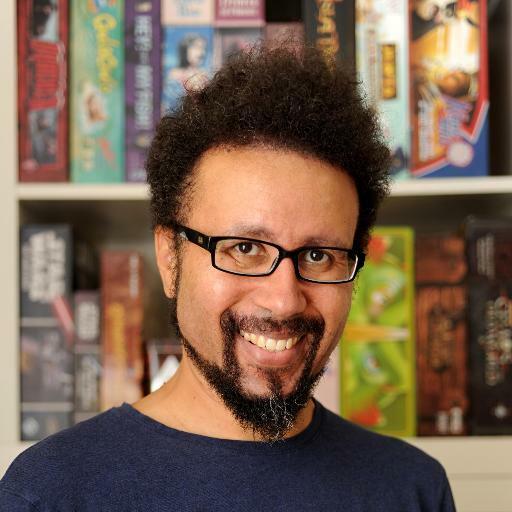 Some cool news that came out of GAMA is that lauded game designer Eric Lang is joining CMON April 1st as their Director of Game Design. He will be making games, be more deeply integrated with the design and development team, and will be working on games that are not ones that he designed. I’m super excited about this because Lang is a huge proponent of moving the industry forward into being more inclusive and diverse. He has many times specifically called for more women and people of color to be represented, both in the industry and in the games themselves. 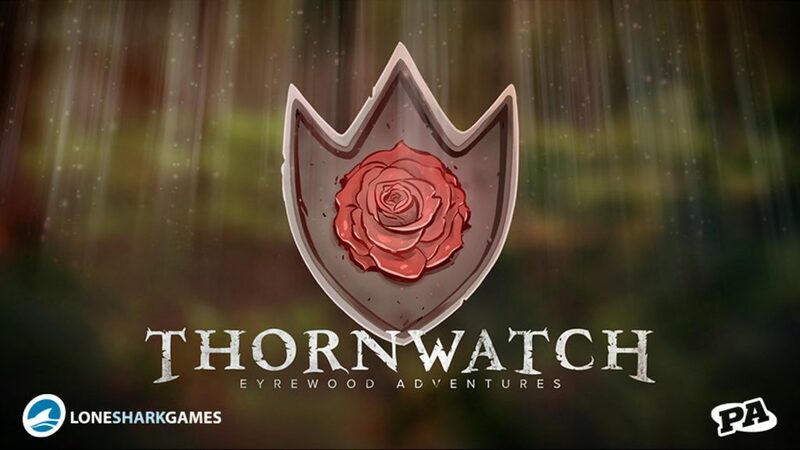 You’ve probably heard about Thornwatch, the board game set in the world dreamt up by the team at Penny Arcade. The Kickstarter was funded successfully, and is still in development. The main piece of news announced at GAMA is that they are shooting to release the game at PAX Unplugged, Penny Arcade’s newest convention, which is purely a tabletop gaming convention. PAX Unplugged will take place November 17-19 in Philadelphia, PA.